This past week we had such beautiful weather in Aberdeen (and throughout the UK), and we took advantage of it. On Saturday we hopped on a bus headed to Huntly Castle. This site has had a castle on it since the 12th century, though most of the current ruins date to the 15th century. It was interested to see how the site had been build and rebuilt, and how different sections are in completely different levels of ruin. 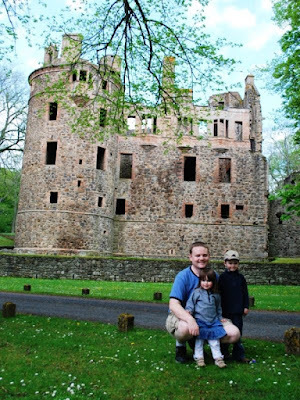 This is a fun castle for kids because there is so much open space to run around. Joshua loved climbing on the rocks that use to be walls to parts of the castle. The brew house is one of the few that is still standing, complete with a roof. Abigail was fascinated by the weird hole in the floor that was used in the brewing process. Joshua loved all the barred windows in the mail castle. There were still some pieces of the beautiful wall and fireplace ornamentation (but you have to check out my photo album to see those pictures). 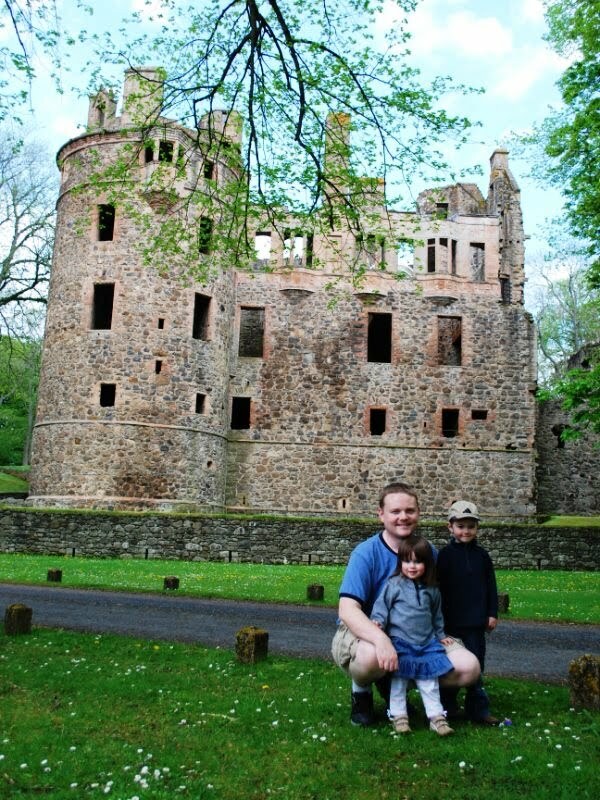 The kids loved exploring all the parts of the castle. Joshua was also drawn to the sound of the river on the other side of the hill. In the gift shop, the kids enjoyed trying on all the hats and helmets. These jousting helmets were the favorites, probably because the face pieces could be moved. What a beautiful day! The weather was perfect, and we had a wonderful time together. I'll be writing a follow up post to talk about our time exploring the rest of Huntly (the city). How fun!! You guys are always doing so much together. Glad everything is going well and you are able to really enjoy your time there. The kids look so grown up. Miss you. That looks like so much fun! I bet my kids would love climbing on all the ruins. And those helmets, my son would have so much fun with that. Ooooooooh - that is SO beautiful! Thank you for sharing the pictures and tour with us!